A Cardboard Problem: My boy is on fire. Adam Lind is off to a ridiculous start this season. 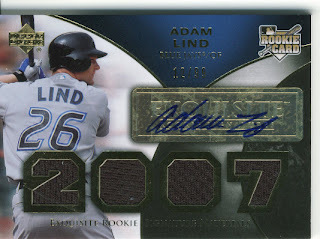 Great for the Blue Jays, great for psad21 who has him in our fantasy league, and even better for me and my collection. Lind is hitting over .400 up to tonights game and is just crushing the ball right now. This makes me happy, but also makes me mad. Now, look at this auction... I am curious as to what the offer is, and I am going to watch this to see what and if it sells very high. Am I the only one that thinks this is nuts? I'm thinking of a new contest, so stay tuned for that one. I'm disappointed, Marie. I wanted to read a post from you about the YANKEES tonight! They treated me to one of the funnest games that I've ever witnessed. One of my favorite moments was during the pre-game intros. The Rays played the song "Money for Nothing" as the Yankees were introduced. The folks responsible for the music at the new Yankee Stadium might wanna play that one too - it really fits the team! Lind is leading the Blue Jays ahead of both the Yankees and Rays. Doesn't matter. I'll save my "one and done" chant for the end of the season. That's baseball. Everything that happens in the first week of baseball will be the same at the end. Baseball is crazy like that. Lind is going nuts. I made a 3-way trade in one of my leagues two days before the season that brought him over to my team. Sweet.